The Ministry of Agriculture and Rural Development, the Ramsar Administrative Authority in the Republic of Algeria, has newly designated 13 additional Wetlands of International Importance. In studies assisted financially by the Living Waters Programme of the Worldwide Fund for Nature (WWF International), the Ministry has presented well-researched Ramsar Information Sheets on an array of wetland types in various parts of the country. 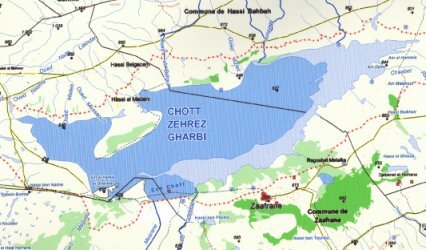 There are several "chotts" or seasonal salt lake/flats (we learn that the word "chott" means "border" in Arabic, referring to the vegetated ring surrounding the salt flat itself, which is properly called a "sebkha"), mostly in the steppe area in the north of the country between the northern and southern ranges of the Atlas mountains. We also have a "gueltate", in Tamanrasset, one of the rocky terraced pool systems found in the high mountains in the south, not unlike the fascinating Ramsar site at Issakarassene. 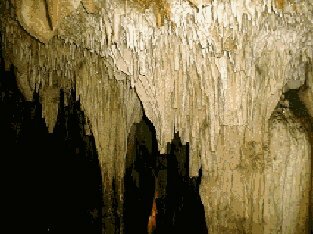 There is a karstic subterranean hydrological system, Ghar Boumâaze, said to be the largest cavern network in Africa, with remarkable flora and fauna both inside and out. And a classic set of oases, complete with the fouggaras, those communal water-channeling system a thousand years old that we learnt about from Algeria's previous designations in February 2001. As well as a few lively pools and marshes lying behind dune systems along the Mediterranean coast. And as well as geothermal springs in the Ksour mountains into the bargain. Special thanks have to go to the Algerian authority for these superb new designations, particularly to Dr Ammar Boumezbeur who led the research efforts, as well as to WWF International for the long involvement of the Living Waters Programme in the safeguarding of these important North African sites. 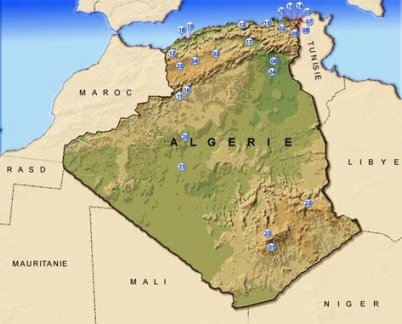 Algeria now has 26 Ramsar sites, covering a surface area of 2,791,992 hectares, and boosts the Convention's totals to 1305 sites covering 110,028,570 ha. Aulnaie de Aïn Khiar. 04/06/03; El Tarf; 180 hectares; 36°40'N 008°20'E. National Park. A wetland type characteristic of the El Kala National park but extremely rare elsewhere in Algeria. L'Aulnaie (alder grove) de Aïn Khiar shelters several species, represented by ash Fraxinus sp., alder Alnus glutinosa, and poplar Populus sp., whose principal characteristic is high water demand. Located between the littoral sand bar and the agricultural plain of El Tarf, the site receives water during winter from the floodplains of the Oued El Kebir which flows through the region and transforms it into marshy zone. This forest environment includes the country's largest number of raptors and large avifaunistic species as well as Ardeidae (herons, bitterns). Loss of trees and shrubs to illegal cutting and natural causes, as well as pressures from agricultural expansion, are seen as the chief potential threats. Ramsar site no. 1293. Chott de Zehrez Chergui. 04/06/03; Djelfa; 50,985 ha; 35°15'N 003°30'E. 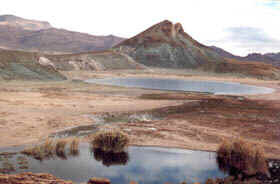 A vast endorheic depression, part of an extensive system of large chotts in the high steppes between the Atlas Tellien and Atlas Saharien mountains, populated by numerous permanent and seasonal lakes and pools and shrub-dominated wetland. The site is uncommon for the Mediterranean area in view of the extent of its surface area and catchment and particularly for its presence in an arid zone. It is also representative of the Mediterranean area in the presence of several types of soils and steppe vegetation. It is extensively used for pasturage and plays an important role in groundwater recharge and flood control. A number of rare and endemic plant species are found, including the herb Herniaria mauritanica and the glasswort Salicornia arabica. The Marbled Teal, listed as vulnerable in the IUCN Red List, is recorded in small groups, but insufficient research has been done on other species. Ramsar site no. 1294. Chott de Zehrez Gharbi. 04/06/03; Djelfa; 52,200 ha; 34°58'N 002°44'E. Like the nearby Chott de Zehrez Chergui, an endorheic depression with numerous permanent and seasonal lakes and pools and shrub-dominated wetland between northern and southern ranges of the Atlas mountains. The "chott" (signifying in Arabic the vegetative border around a "sebkha", or saline lake) of Zehrez Gharbi supports vegetation characteristic of the high plains of the Maghreb steppe area. At least six sand- and salt-loving plant species, considered rare in the region, are found in the site, and Salicornia arabica is considered very rare. Apart from salt extraction, which has always been practiced in the sebkha both in traditional or modern ways, the pastures of Zehrez Gharbi are particulary known for the production of beef and veal of excellent quality, as well as for the sheep of the Maghreb called "Ouled Djelal". Ramsar site no. 1295. Chott Melghir. 04/06/03; El Oued, Biskra, Khenchela; 551,500 ha; 34°15'N 006°19'E. A large complex of seasonal salt lakes and pools and freshwater pools, representative of arid and hyper-arid saharan environments. Of the characteristic type of vegetated chott surrounding sebkha, or salt lake, entirely devoid of vegetation, the site is remarkable for lying at the lowest point in the Sahara desert, 35 meters below sea level. It shelters vulnerable and threatened flora species, and the number of endemic species reaches 14, the most notable of which are Fagonia microphylla and Oudneya africana, found only in Algeria, and the particularly interesting Ammosperma cinerea. The area is currently used for grazing. Ramsar site no. 1296. Grotte karstique de Ghar Boumâaza. 04/06/03; Tlemcen; 20,000 ha; 034°42'N 001°18'E. A representative example of continental wetland including a karstic subterranean hydrological system, extremely rare and underrepresented in the Ramsar List. Discovered in 1931, the Ghar Boumâaza caverns, the largest known underground cave network in Algeria and Africa, follow the river Tafna under the Tlemcen mountains at about 1070m altitude - some 15.5 km have been visited so far. Fauna inside and outside the caverns have been little studied, but at least three rare kinds of bat have been noted; avifauna are represented by the woodcock Scolopax rusticola, the Barbary partridge Alectoris Barbara, the blue rock thrush Monticola solitarius, and the golden eagle Aquila chrysaetos. Protected mammals such as porcupine, the golden jackal Canis aureus, and the common genet Genetta genetta can be found in the area. The permanent presence of water has favored the establishment of hamlets, the people of which are able to irrigate fields and practice grazing despite the semi-arid climate. Ramsar site no. 1297. Gueltates Afilala. 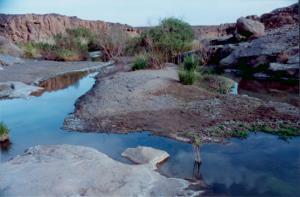 04/06/03; Tamanrasset; 20,900 ha; 23°09'N 005°46'E. Ahaggar National Park. The gueltates, unique to this region, comprise small terraces, pots and small cascades in which water runs permanently in this completely desert environment. 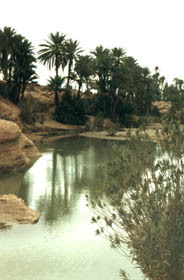 The site contains rich vegetation more or less similar to that of the Gueltates d'Issakarassene Ramsar site, and the diverse fauna includes fish species such as the desert barbel. The Gueltates Afilal constitute the most significant stream of the Ahaggar and the Atakor massif (3,000m), and, with Issakarassene, are among the best-known gueltates due to their welcoming location as a stop-over along the tourist track to Mt Assekrem. The nomadic Touaregs of Tamanrasset use the gueltates to store water for domestic needs and as a watering site for their herds, and the area is a popular place visited by some 20,000 local and foreign tourists per year, without so far having suffered too much pressure from their presence. Ramsar site no. 1298. 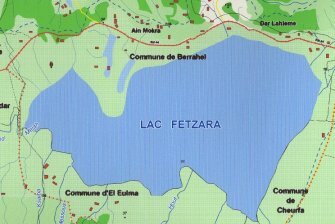 Lac de Fetzara. 04/06/03; Annaba; 20,680 ha; 36°47'N 007°32'E. A lake of some 17km by 13km, very variable in the extent of open freshwater from 5,800ha to an additional 4,000ha of flooded land in the rainy winter season, surrounded by permanent and seasonal marshes and pools and by irrigated and seasonally inundated agricultural land. The site's great importance at the beginning of the 20th century as a nesting and wintering place has been reduced by drainage works during the colonial era, not entirely regained in recent years, but it is still a significant site for waterbirds, particularly for Anatides and coot Fulica atra, up to 42,000 in 1990. Towards the end of the winter season, a number of important waterfowl, mainly Greylag goose Anser anser and Wigeon Anas Penelope, come to the site from nearby Ramsar sites Oubeïra and Tonga when excessive water level increases make its difficult for them to reach feeding ground there. Agriculture and pasturage are practiced in the area, and the expansion of agricultural area is seen as a potential threat. Ramsar site no. 1299. Le Cirque de Aïn Ouarka. 04/06/03; Nâama; 2,350 ha; 32°44'N 000°10'E. Known by geologists as a "cirque" or amphitheatre-like bowl, this geothermal wetland in the Ksour mountains of the Sahara Atlas is a basin circumscribed by abrupt mountains 1,672m high with two small ponds with saline, clear and deep water. The water from thermal sources is used as a curative spa, whereas the cold sources provide drinking water for the local population -- as a geothermal wetland, the site is extremely rare in the Mediterranean area. The site is famous for ancient practices of hydrotherapy and traditional salt exploitation, and it is an excellent biotope for at least two nationally protected, seriously threatened plant species, Pistacia atlantica desf and Helianthemum lippi. Most remarkable is the presence of the dorcas gazelle (Gazella dorcas) and mountain gazelle (Gazella gazella), classified as vulnerable in the IUCN Red List. Rock paintings and engravings date back more than 10,000 years and testify to the rich fauna of the region at that time (lions, elephants, wild sheep, bustards and ostriches). Ramsar site no. 1300. Marais de la Mekhada. 04/06/03; El Tarf; 8,900 ha; 36°48'N 008°00'E. A mostly freshwater marsh in an alluvial basin of the Mafragh plain, brackish in the downstream part where it meets the Mediterranean Sea through a narrow opening. With a depth of 0.5 to 1 m, the site is vegetated primarily by rushes Scirpus sp. covering more than 80% of the surface. The area is important as a nesting and wintering site for ducks and coots and serves as a nesting site for the IUCN Red-listed White-headed duck Oxyura leucocelphala, as well as the Ferruginous Duck Fuligule nyroca. Four species are considered to surpass the 1% threshold: Oxyura leucocelphala, Anser anser, Anas penelope, and Anas strepera. 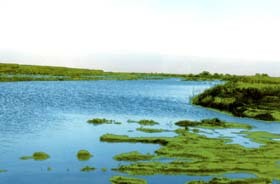 In summer,cattle pass through the marsh; the edges of its banks are partially used for agriculture, and the site is used for traditional fishing of eel and various fish species. Overgrazing is seen as a potential threat, especially in times of drought. Ramsar site no. 1301. Oasis de Moghrar et de Tiout. 04/06/03; Nâama; 195,500 ha; 32°53'N 002°02'W. Comprises the two Oases Moghrar (Foukani and Tahtani) and the Oasis Tiout at about 1000m altitude, connected by the upper reaches of the Oued Namous and ringed by the southern flank of the Ksour mountains at about 1700m. With the site's typically dry saharan climate, the oases support family agriculture, mainly the cultivation of date palms and vegetables at different levels of terraces; "feggous" and "Aghrass" are the date palms of excellent quality that are of conservation interest. The existence of the fouggaras, an 11th century or earlier system of water capture and distribution, is characteristic of the region and qualifies the site as a Ramsar wetland type Zk(c) - "Karst and other subterranean hydrological systems, human-made". Moghrar is ornithologically significant, with Common or Red Crossbill, woodpigeon, Blue Rock Thrush, among others. The area is known for its ancient rock art, a small prehistory museum, and its Ksar or "fortress", which was formerly the stronghold of the Sheik Bouamama, a key figure in the country's fight against colonialism. Ramsar site no. 1302. Réserve Naturelle du Lac de Béni-Bélaïd. 04/06/03; Jijel; 600 ha; 36°53'N 006°05'E. Nature Reserve. A small lake of 10 hectares, surrounded by lake vegetation represented by Tamarix, alder Alnus glutinosa and ash Fraxinus angustifolia, the reed Phragmites australis, and the narrow-leaf cattail Typha angustifolia, with numerous small streams, and with a dune cordon separating the lake from the Mediterrean, part of the coast of which is included in the site boundaries. The site supports a rich and diverse avifauna, including several rare species such as Aythya nyroca, Porphyrio porphyrio, and small communities of Alcedo atthis and Acrocephalus scirpaceus. Human pressures, especially from over-extraction during dry periods and from the extension of agriculture, are perceived as potential threats. Ramsar site no. 1303. Réserve naturelle du Lac de Réghaïa. 04/06/03; Alger; 842 ha; 36°46'N 003°20'E. Nature Reserve. 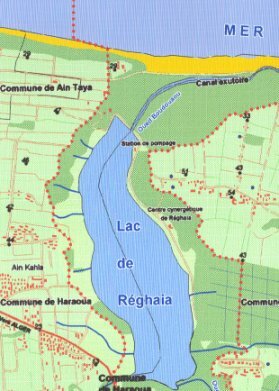 The lake and marsh of Réghaïa corresponds to the wadi Réghaïa estuary, the mouth of which has been blocked by a sand ridge. Some 600m inland, an artificial barrier retains permanent water in the marshes, composed mainly of reeds and rushes. 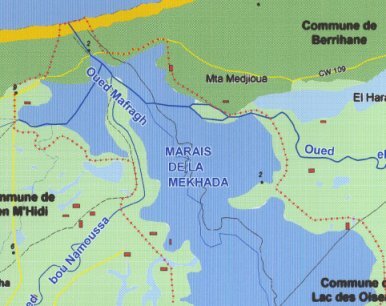 The coastal marsh of Réghaïa is the last vestige of the old Mitidja (alluvial plain of Algeria, limited by the sahel, the massif of Miliana, the Tellian Atlas and large Kabylie), and currently the only wetland of the "Algerois" geographical area following drainage works during the colonial era. It directly faces the Mediterranean and thus plays a major role for the migratory birds after the crossing of the Mediterranean Sea and from the Sahara desert. A small island, Agueli or Bounettah, one km off the coast, with the surrounding waters, is part of the site and increases its value for migratory birds. In spite of its declining size, the lake has revealed an unsuspected wealth and diversity not only in wintering migratory birds but also of rare nesting bird species - it shelters more than 203 waterbird species, among which four species are classified as rare. The lake provides irrigation for 1,200 ha of arable lands, and its beaches, the most beautiful of the Algiers coast, attract many visitors during summer. The Centre Cynégétique de Réghaïa organizes World Wetlands Day educational expositions for the public. Ramsar site no. 1304. Tourbière du Lac Noir. 04/06/03; El Tarf; 5 ha; 36°54'N 008°12'E. Within El Kala National Park. 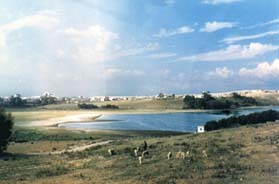 The "peat bog of the black lake", a former lake accidentally drained by two combined actions, the opening of a significant drinking-water drilling in 1990 and the building of the road connecting the towns of Annaba and El Kala. All that remains is the underlying peat bog, considered to be one of two sites where the yellow water lily occurs. The site forms part of an interesting area in terms of fauna and is visited by species like the Barbary Red Deer, European Genet, the Egyptian Mongoose, and Spotted Hyena. Ramsar site no. 1305. 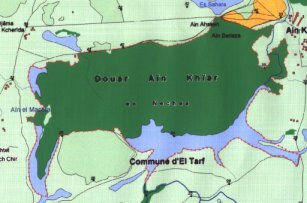 -- photos courtesy of the Direction générale des forêts, Algeria; maps were scanned from the RISs and do not necessarily show the extent of the entire Ramsar sites. -- with reporting by Nassima Aghanim, Ramsar.